They say you can't teach an old dog new tricks. But for 'Wookie' the dog and his pack it appears the saying is false as these howling huskies sing the baritone to Donny Osmond’s Puppy Love. In this remarkable video, believed to have been filmed in America, Wookie starts off singing and soon the whole family are hard at work. Perhaps Wookie is trying to sing, perhaps the dog is trying to emulate its namesake from the Star Wars films. Either way the husky is more than happy to accompany its owner’s rendition of the 1972 chart-topper. The owner, who speaks with an American accent, asks her pet husky, ‘Can you sing the low part? I’m not good at the low part.’ Wookie happily obliges beginning the baritone of the track as the rest listen in. The ‘lead singer’ then turns suddenly as if to cue in the rest of the pack, who burst into song. They create a glorious wall of sound to giving the song a stunning chorus. Female voices behind the camera can then be heard saying, ‘Ohhhh… Ok that’s enough,’ ‘Enough puppy love’ they add as the pack quietens down before Wookie gets in the final note. ‘Got to have that last word don’t you Wookie,’ says the owner who must have seen it all before. The song Puppy Love was made famous after Donny Osmond covered Paul Anka’s original hit in 1972 and the single shot to number one in the UK charts. 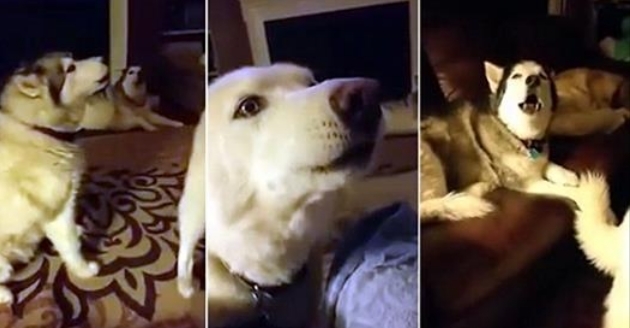 Responses to "Adorable moment pack of huskies 'sing' along to Puppy Love "
Is the leader a white Shepard? looks like one but sounds like a Husky. Either way, quite a song.